The 2019 Ski Nautique has been approved to pull athletes in American Water Ski Association sanctioned tournaments in 2018. Members of AWSA’s Towboat Committee, technical experts, drivers and top water ski athletes conducted the evaluation on May 4 in Elk Grove, Calif. The 2019 Ski Nautique joins the Centurion Carbon Pro, Malibu Response TXi, MasterCraft ProStar and Ski Nautique 200 (open bow and closed bow) as approved towboats in the current year. To view the approved list and respective technical specifications, click here (PDF). In 1983, the AWSA established its first set of comprehensive technical evaluations of inboard and outboard water ski towboats. These procedures have been updated every year since then to take advantage of the most up-to-date technology available. To have a boat evaluated, a manufacturer must be a USA Water Ski & Wake Sports Gold Corporate Member, and a member of the USA Water Ski & Wake Sports Foundation and Water Sports Industry Association. While successful completion of the towboat evaluations allows a manufacturer to pull tournaments, there also are several other advantages. Private-lake communities continue to be built all over the country. Most developments require any boat used on the lake to be on the AWSA-approved towboat list. Many city and community-owned lakes also only allow AWSA-approved towboats on their waterways. Public and private lake communities have the peace of mind knowing these boats have been put through the most rigorous testing in the industry. Approved towboats also carry more value to marine dealers in terms of marketability. 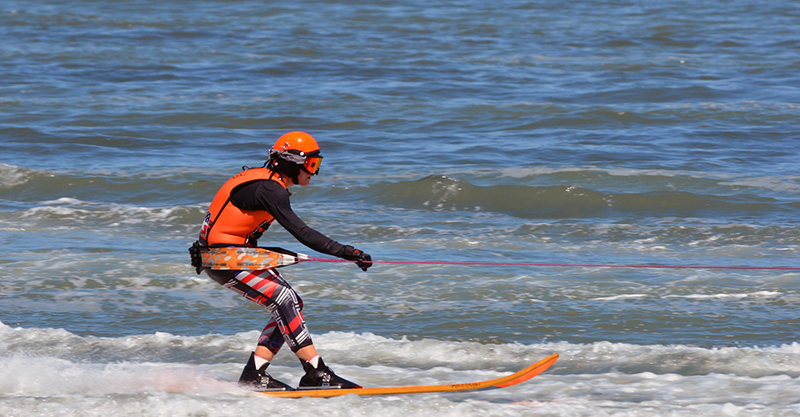 Once a model successfully completes the evaluations, the manufacturer is encouraged to pull skiers at AWSA-sanctioned tournaments. By pulling a predetermined number of sanctioned tournaments at various levels of competition, a manufacturer’s towboat model becomes eligible to participate in AWSA’s regional and national championships. Although the Towboat Committee compiles reams of test data for each towboat, it is important to note that this information is confidential and only released to the manufacturer. Currently, the purpose of the evaluations is to determine if a towboat has suitable characteristics for water ski competitions. Before a boat even hits the water, the test team runs through a detailed check-in procedure. All aspects of a boat are measured, including the overall length, width, fin placement and depth, prop pitch, and shaft angle. Engine and transmission serial numbers are recorded along with technical data from the power package. The boat’s hull characteristics are noted, and pictures of the stern, side, cockpit and interior are taken. To be used in competition, three-event towboats must meet certain performance standards that are designed to give skiers, drivers and officials optimum conditions during tournament competition. These standards are established by AWSA’s Towboat Committee to achieve tournament-capability status. Each three-event boat must pass a series of 11 tests and sub-tests: power and acceleration, handling and maneuverability, engineering, drivability, sound level, slalom course center-line deviation, slalom spray, jump course center-line deviation, and slalom, tricks and jump wake evaluations. The object of the test is to determine whether a boat has adequate power to pull slalom and jumping events. The distance required to pull a skier from a deep-water start on a competition slalom ski and accelerate to 36 mph is measured. This distance must not exceed 250 feet for Class C tournaments. Record capability (R) tournament boats must achieve 36 mph within 230 feet. Deep-water starts are simulated with a test drone, designed to provide a pull equal to that of a 180-pound slalom skier. Use of a drone insures consistency in testing. GPS Systems and radar guns are used to measure distance to speed, while the corresponding software provides exact measurements as well as graphical representations of acceleration testing. This is especially helpful for manufacturers testing different engine and/or propeller combinations. After successfully completing the power and acceleration phase, power also will be tested in subsequent slalom and jump centerline deviation tests. Drivers constantly observe a boat’s power while pulling skiers under simulated tournament conditions. This test measures the amount of boat path deviation from the pull of slalom skiers and jumpers. A boat’s ability to track well is paramount in order for the driver to provide a straight pull, whether a skier is ripping up the slalom course at short line or gunning for a 200-foot jump. Measurements are taken via end course video units that provide feedback to a computer. Tracking targets are strapped to the pylon and on the front of the windshield to follow the boat and allow the test team to easily spot excessive tracking problems. The computer measures the exact lateral movements of the boat during each pass through the slalom and jump courses. Data, including the maximum deviation, is recorded for multiple slalom passes at both 34.2 mph and 36 mph; and at jump speeds of 31.7, 33.6 and 35.4 mph. For a boat to pass, the average must be less than 0.4 feet (4.8 inches) for slalom, and 0.8 feet (9.6 inches) for jump. Test team members rotate through the cockpit allowing several drivers to evaluate the tracking. While centerline deviations are being measured, skiers are evaluating the boat’s wake characteristics and the effect they have on the skier. Slalom skiers evaluate wake size, hardness, rooster tail, and the amount of spray for each propulsion combination (engine and/or prop). Using a numbering system, skiers are independently interviewed, and they rate the wake at several line lengths and speeds. Jumpers also are looking at the effect a boat’s wake has on the counter cut and approach to the ramp. Wake height and hardness are rated on a similar numbering system based on the effect the wake has on the skier at several speeds. Separate testing is done to evaluate each boat’s tricks wake. Tricks skiers look at the wake table, turbulence, height/width, and definition and symmetry, and then they rate each wake accordingly. Upon reviewing the skiers’ scores from all the wake evaluations, the test team looks for patterns of poor scores and negative skier feedback. Although the scores are subjective, a pattern of poor scores can cause a boat to be further evaluated and/or failed. Each boat is driven through a figure-eight course with a circle diameter of 75 feet. Passes are made at 17 and 26 mph in both directions. The boat is then required to make 180-degree turns at 36 mph within the 150-foot diameter course. This test ensures all maneuvers can be made safely and under control. All phases of this test must be passed for a boat to continue testing. Three-event boats must not produce more than 75 decibels of sound while passing through the slalom course at 34.2 and 36 mph. Sound levels are recorded through a sound meter at a distance of 125 feet from the course centerline with readings taken in each direction. The purpose of this test is to make sure these boats are not in violation of generally accepted maximum noise level standards. While conducting all phases of testing, drivers are evaluating the boat’s combination of power package, design characteristics, controls and instrumentation. These combinations should allow drivers to provide smooth, consistent pulls within record capability tolerances. Test team members also are looking at each boat’s design, whether it will hinder the performance of skiers and officials, and if any obvious safety hazards are present. Comments are recorded on each of these issues with serious deficiencies noted.